Zingerman's is a well-established haven of quality foods in Ann Arbor, Michigan. Their empire includes a delicatessen, creamery, bakehouse, coffee company, and now, a restaurant: Zingerman's Roadhouse. I've recently read quite a few negative reviews of Zingerman's Roadhouse, saying that the prices are too high for the type of food that you're getting. I wholeheartedly disagree. 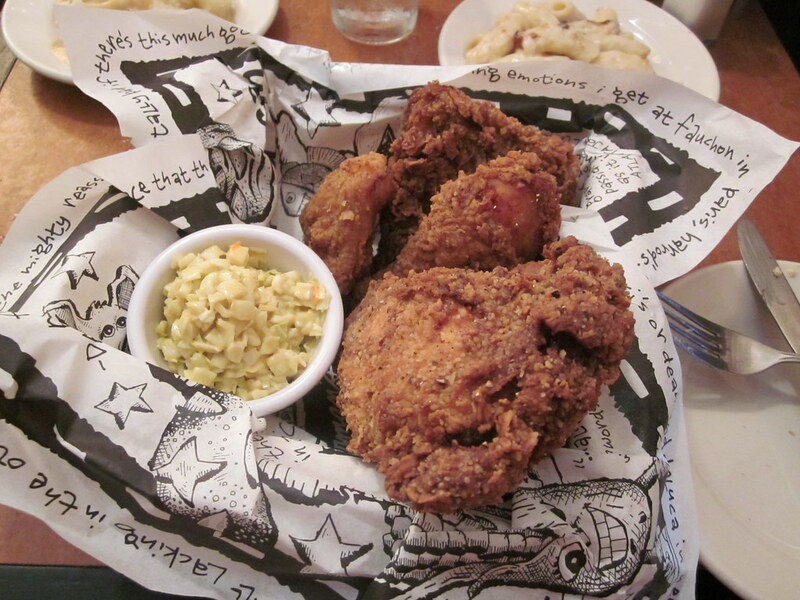 The food at Zingerman's Roadhouse might be typical American fare: fried chicken, BBQ, mac and cheese, etc. but the difference between it and the Applebee's down the street is that Zingerman's actually takes great care in choosing their ingredients. You know exactly where the chicken is coming from. You know, not only what type of cheese is in the mac and cheese, but where they got it. To some people this might be pretentious, but to me, it's how we SHOULD be eating. I'd rather pay a little extra to know I'm getting quality ingredients than rock bottom prices and lack of concern for quality. Americans have an extremely unhealthy relationship with food: choosing to eat the worst things for us because they're the cheapest. I commend Zingerman's for providing people with a different option: those who actually care what's going into their bodies. That's not to say that the food here is health food, not by any means. But at least you know that it's minimally processed. My husband and I ate there on a Friday evening and it was busy, but not busting at the gills. We ordered way more food than we thought we could finish because we planned on taking some of it home. The food was so good though, that we only took home part of a fried chicken breast. 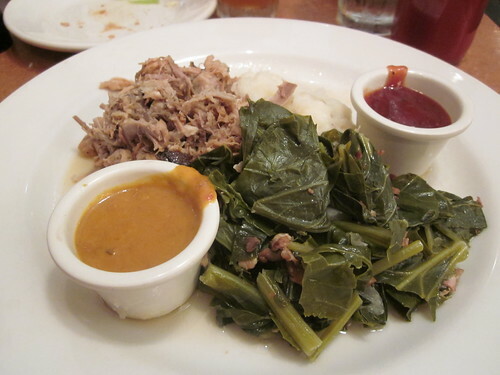 I ordered the BBQ pork entree that came with mashed potatoes and southern-style braised greens, and your choice of Eastern North Carolina vinegar sauce, South Carolina mustard sauce, or Memphis tomato sauce (I got them all). I am not normally the type of person to finish everything on my plate at a restaurant, but I can say that there was nothing left to put in a box to take home when I was done with it. I was actually not a fan of the mustard and tomato sauce, but the rest of the dish was fantastic. My husband ordered the buttermilk fried chicken which I highly recommend if you ever go there. It was crunchy and peppery, and juicy and all the things you want in a fried chicken. If you order it though, get the four piece instead of the two piece because, like all fried chicken, it's even better the second day, cold out of the refrigerator. In addition to the aforementioned mound of food, we also shared a side of mac and cheese with raw-milk Vermont cheddar. Ummm... hello? Do you see this picture? Do I even need to describe how delicious it was? 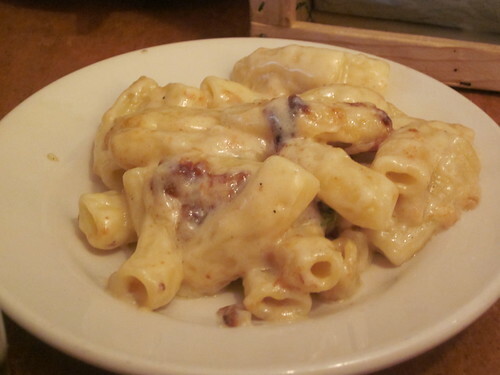 And, they gave us some of the very best part of the mac and cheese: the brown crispy bits from the corner. Despite all the food we consumed during dinner, we still ordered dessert. We chose their homemade gelato. It was nothing earth-shattering, nor could it ever be compared to real Italian gelato, but it was a lovely light closing to the meal. We chose mint chip, vanilla, and lemon as our three flavors and it was the perfect end to our meal. So if you're in the area and you're looking for quality regional American fare, look no further than Zingerman's Roadhouse in Ann Arbor. I'm already counting the hours until the next time we get to go. It's a great restaurant, Beth - I agree! We've eaten there several times, and always had wonderful food. The last time we tried their mini-cheeseburgers with four different cheeses - superb!!! Zingerman's is awesome. Everything is just soo tasty! :) Glad you liked eating there!